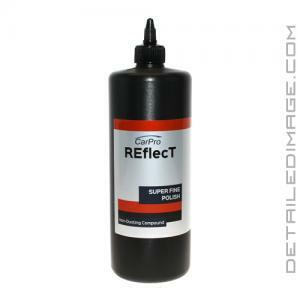 CarPro Reflect Polish is an ultra fine finishing polish that will enhance your gloss to amazing levels! Holograms, micro-marring, and compounding haze are no match for Reflect. Pair this polish with a finishing pad on a rotary or dual action polisher and when you are finished, just stand back and admire the deep glossy finish. Reflect is capable of removing up to 3000 grit sanding marks and it does not contain any waxes, silicones, or fillers. The finish you see is from this polish removing imperfections, not filling them in! With a long work time and low dusting formula, Reflect is a joy to work with. Pair it with a heavier cutting compound for a two step polishing process, or as a one step on a vehicle with light imperfections. If you are looking to take your paint to the next level, finish your polishing process with CarPro Reflect! CarPro Reflect has produced outstanding results on many vehicles of all makes and colors. The product is easy to use, very glossy, and saves us a fair amount of time compared to polishes that require long working cycles to completely break down. If you're looking for a new finishing polish, I would highly recommend CarPro Reflect. Creates a reflective high gloss mirror finish. Removes holograms and fine swirls/scratches. For conventional & scratch resist paint. Grit sanding scratches from P3000. Shake well & pour 4-5 drops on foam finishing pad. Speed range polish: 800-1000 rpm. Work until full polish break down. Hands down my FAVORITE finishing polish. I own and have used nearly every single compound/polish you can think of and this is easily my favorite finishing polish ever. I do a lot of ceramic coatings (various brands) and this polish is just so clean, which really comes in handy during the prep wipe stage and it also lets me worry less about if the polishing oils are hiding any defects that might be left behind! Crazy easy wipe off, barely any dusting (may be my pad), and the gloss is unreal. For the record, I use Sonax Perfect Finish, Americana Finesse, Meguiar's M210, and Scholl S30+ and this surpasses all for me on the paints I have used it on. I have not yet explored it's cutting capabilities but will do that soon. My suggestion - use 4 SMALL dots of product and do not prime the pad. Work literally 2 passes max (slow and medium-light down pressure) until the residue is clear and broken down. I noticed if it is worked too long, it can stick to the paint (like essence) and have to be polished off. If you don't overwork it, it doesn't happen. And it diminishes FAST so it really speeds things up. WAAAY more cut than I was expecting, in a VERY good way. Completely expecting to need to go straight to Fixer on a 12 year old vehicle with no previous correction and lots of damage, I decided to try Reflect first and work my way up... glad I did. Paired with a Boss microfiber pad (regular, NOT heavy cutting) this took out 99% of the imperfections in ONE pass... And didn't leave any sort of correcting marks, so could be used as a 1 step on a wide range of damage. Now the less than good... Try as hard as I could, this would always leave a residue on the paint. I tried more/less product, pad conditioner, different work times... ALWAYS left some residue unable to be wiped off, even with some detail spray. This meant I had to follow up with Essence to remove the residue, but at the same time it meant I got that extra bit of correction and no need to prep before C Quartz. Overall, a fantastic product for basically no dust, great correction, speed and value. I will definitely continue to use it, haze or not. Machine applied - works well and brought out a deeper shine quality than I had seen previously. Good product.